Hi, our son Gabriel was born in London. He was diagnosed with propionic acidemia at 2 weeks of age after spending his first hours of life hyperventilating and with severe acidosis and high ammonia. Luckily, the medical team at Great Ormond Street Hospital for Children was very good at stabilizing him and at diagnosing him very quickly. Despite never showing actual fits, Gabriel was then diagnosed with infantile spasms (a type of childhood epilepsy) at 5 months of age after deteriorating progressively. We were again very lucky that he responded well to treatment with vigabatrin. He was weaned off medication at one year of age and has been seizure free since. At that same age, he stopped eating by mouth completely and a g-tube was inserted in his stomach for feeding. His formula currently comprises pediasure, polycose, XMTV1, vitamins and flax oil. He is been very stable metabolically for the past two years and is been followed up by the metabolic team at Children’s Hospital of Philadelphia every six months. Gabriel’s development was very slow until 18 months of age but he has made tremendous progress since he started therapies with the Early Intervention Program when we moved to the United States. He just transitioned to a special education pre-school program where he continues receiving OT, PT and ST. Since he started school, his gains have been really amazing. He just started talking and is able to comprehend perfectly and speak words in all three languages he hears. He has also gained cognitively and matured a lot. He has still a lot to catch up being his major challenges his low tone and his speech but we embrace his enthusiasm and effort and try to offer him as much support as we can. As is often the case with so many children who are born with an organic acidemia, Gabriel’s first year of life was full of difficulties and hospital stays. After his initial crisis at 24 hours of age, Gabriel had lots of episodes of metabolic decompensation, and high ammonia levels, compounded by undiagnosed epilepsy (infantile spasms). Nevertheless, he started to stabilize around the time of his first birthday, and you can check out a summary of Gabriel’s first five years of life in a previous report we wrote for PAF. During his first year of life, Gabriel spent 9 months with a nasogastric tube, which was so uncomfortable that it greatly contributed to his decision to stopping eating. But he got a G-tube at 15 months of age, and quality of life improved, not only for him, but also for the rest of the family. Through the G-tube, we started managing him much better at home because we did not have to rush him to the hospital every time he started throwing up. He became even more stable at the age of 3, and he started preschool also then. At that time, Gabriel didn’t have words and was incredibly delayed in all domains (especially motor and language) but he has overcome a lot and has been steadily progressing ever since. This was a little miracle to him thanks to an amazing teacher. Indeed, one very important thing for us is that Gabriel has not stopped developing, even though he makes progress at this own pace (meaning, very slow!). At the age of 5 we found a school that could target much better his language delays and lack of socialization skills. He spent 5 incredible years at this fantastic setting. It was a great program for him. Although still very delayed, Gabriel now chats a lot and understands and speaks both English and Spanish (both his father and mother are native Spanish speakers) although he is clearly dominant in English. He now has a few friends at school and shows more interest for group activities, like soccer. He is no longer afraid of noise at the movies and initiates conversations with other children in the park. 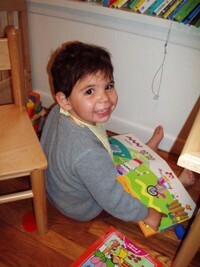 Academically, Gabriel is quite delayed but the fact that he is reading and writing is a miracle to us. He is also able to do very simple math. The other little miracle we experienced with Gabriel is that at the age of 6 we found a wonderful feeding therapist (who was actually a special-ed teacher with experience in feeding issues from the behavioral point of view). She taught Gabriel how to eat (after 6 years of being 100% tube-fed). It was a very slow process but Gabriel now eats like 50% of his nutrition by mouth with a very wide variety of (very healthy!) foods: rice, pasta, vegetables, fruits and so on, everything with low protein, although he also eats the occasional egg or fish sticks. The reason why he only eats like 50% by mouth is because he still has very poor oral motor skills, and is very slow chewing and swallowing. Regardless, the fact that Gabriel can eat by mouth has helped tremendously to normalize our family: we go more often to restaurants, and Gabriel is happy to seat at the table with us and even request his own food from the menu. He has gained so much confidence as a result of eating by mouth! 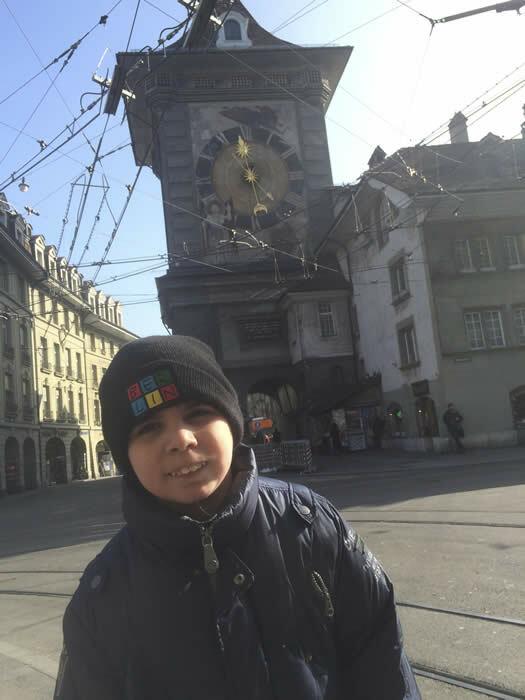 In practical terms, the biggest challenge that Gabriel faces right now is his executive function (he has very poor coordination and motor skills, although he can run relatively well) and his language (he is diagnosed with a language disorder and although his IQ is a bit low, the psychologists think that part of the problem is his severe language issues). As a result of this, Gabriel attends a special-education school with highly individualized education. His class has two teachers and seven other children, and Gabriel still receives a lot of therapy at school (OT, PT, ST). What is crucial about Gabriel’s life is that he is a very happy child. He loves water and has been learning how to swim for two years now and is able to execute quite a nice stroke (although the coordination with breathing is very difficult for him). In the past two winters he has also been trying adaptive ski and has absolutely embraced it. He has been traveling quite extensively around the world since he was 2 months old (we go often to Mexico and Spain to visit our families, and he loves playing with his cousin Marifer). Last year, the Make-a-Wish Foundation granted Gabriel a trip to Japan. He wanted to visit Tokyo, the city where Lightning McQueen (from the movie “Cars 2”) races in the middle of the night lights. It was an absolutely amazing experience and a very beautiful memory that hopefully will last forever in all of us! 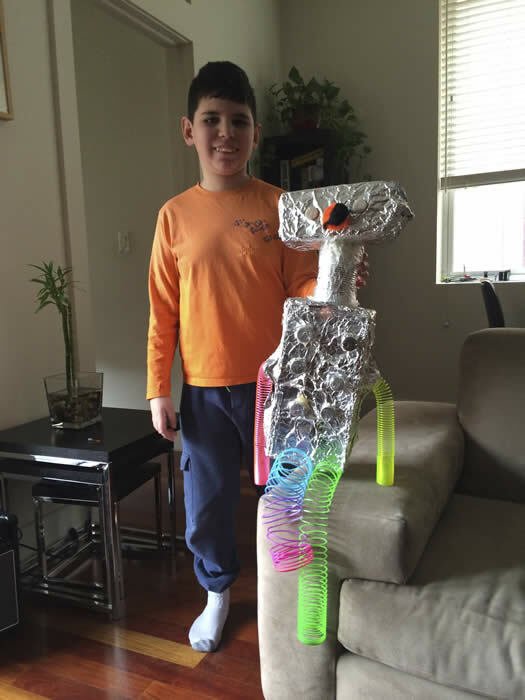 For the past year and a half, Gabriel has been learning how to cook with a special-ed teacher. Although Gabriel is not very big eater he enjoys cooking very much, and we decided to develop a program whereby he could learn new skills and gain independence at the same time. So, every Saturday he prepares a shopping list for a new recipe, goes to the supermarket, chooses the ingredients and pays. Ideally, we are aiming for him to do all this independently at some point. When he gets home, he starts smelling, chopping and stirring. He is now able to turn the gas knobs on, boil water and add salt and pepper to a simple dish! He really, really enjoys cooking, and this is the one thing that takes him away from his video games and such. His new addition to the menu has been “pumpkin pie cheese cake”. He just cannot have enough of it! But he cooks all kinds of dishes from a Thai salad to Mexican corn soup. Although he often does not like the new dishes he makes, he always, always tries them. This plan has been really working very well to the point that Gabriel has expanded the repertoire of foods and flavors he eats now, he is no longer afraid of trying new foods away from home, and he is slowly gaining some skills that, we feel, will be valuable in the near future. Looking forward, we think Gabriel’s life will be very challenging, as he is unlikely to be able to live independently. However, we feel blessed that he is such a kind and caring child who tries to enjoy new adventures, no matter the challenge. So, we try not to think too hard about what it will be, but focus instead on who Gabriel is and what he does right now, taking one day at a time! Please, feel free to contact us if you would like to learn more details about Gabriel’s management or activities.